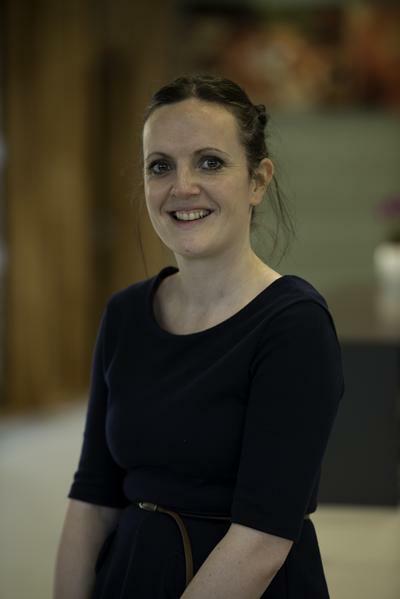 Claire is Associate Professor in Developmental and Skeletal Biology, she leads the Developmental Biology Theme within Biological Sciences (Faculty of Environmental and Life Sciences), and she is part of the Centre for Human Development, Stem Cells and Regeneration (Medicine). She has specific interest in how blood vessels interact with tissues and organs during development, adulthood and disease. To date much of her research has focused on the musculoskeletal system and how with age, unhealthy blood vessels can influence progression of degenerative bone diseases. In addition, she is also focussed on targeting the blood supply to improve fracture repair outcomes and orthopaedic implant longevity. The blood supply to bone is critical for development and is also linked to disease. However, research into this area has been challenging as the vasculature is deeply buried within the bone mineral. To address this, I work closely with engineers, physicists and clinicians and develop new methods to better address the ongoing questions surrounding the regulation of the vasculature in bone. 2017-present: Associate Professor in Developmental and Skeletal Biology. University of Southampton, UK. 2011-2017: Lecturer in Developmental Biology. University of Southampton, UK. 2008-2011: Diabetes Foundation/Diabetes UK Research Fellow. King’s College, London, UK. 2005-2008: Postdoctoral Research Associate (Arthritis Research UK): Department of Veterinary Basic Science, The Royal Veterinary College, London, UK. 2002-2005: PhD (BBSRC). The Royal Veterinary College, London, UK. 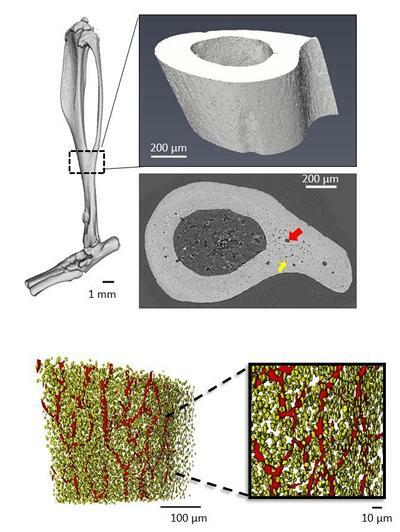 Micro-computed tomography (μCT) provides a 3D and non-destructive imaging technique for bone and the capabilities of standard μCT can be significantly extended when synchrotron X-ray sources are used, achieving higher spatial resolutions to resolve porosity present in cortical bone within a few minutes such as the vascular canal networks (in red) and osteocyte lacunae (in yellow). Images courtesy of Juan Nunez. Claire's laboratory has shown that propagation-based phase contrast-enhanced tomography can be used to resolve soft tissue comprising blood vessel details in bone, when an appropriate propagation distance is chosen. This technique allows for simultaneous visualisation of the cortical bone microstructure including osteocyte lacunae and canal networks alongside the blood vessels themselves. Image, below right, courtesy of Juan Nunez. Raman spectroscopy, a label free technique, has proved to be a useful tool for detecting early biochemical changes in cells. Utilising these techniques we have characterised specific molecular signatures of primary bone forming osteoblasts at distinct stages of osteogenic differentiation and in whole bone sections. Changes in collagen structure is a well-known indicator of bone disease. Using Second Harmonic Generation (SHG), a non-linear imaging technique, it is possible to investigate changes in collagen fibre directionality, length and width to pinpoint specific changes to bone integrity in a variety of developmental and diseased models. SHG can also be used for early detection of collagen type I formation in culturing osteoblasts. Over time the fibres develop and become more ordered as mineralisation occurs. SHG (cyan) can be used to image the collagen fibrils as shown below (primary osteoblasts cultured for 3, 5, 7, 14 days (left to right)). Images courtesy of Stephanie Smith. Bone is a dynamic tissue that is constantly renewed throughout life; Claires research thus far indicates that bone-forming osteoblast cells are a significant source of blood vessel-attracting factors in bone (VEGF) and her long term research aims to identify new drug targets that will permit selective control of bone’s blood supply to allow sufficient support for the process of bone renewal. Claires laboratory in Southampton has unique models in place to dissect the directionality of signalling which exists between bone cells and endothelial cells. This project has received PhD funding from Arthritis Research UK (Alice Goring) and currently is in collaboration with Professor Bjorn Olsen (Harvard School of Dental Medicine), Professor Philipp Thurner (Tuwien, Vienna), Professor Alan Boyde (Queen Mary’s London), Professor Andrew Pitsillides (Royal Veterinary College London), Professor Richard Oreffo (Medicine, Southampton), Professor Phillip Schneider (Faculty of Engineering and Physical Sciences, Southampton) and Mr Doug Dunlop (Medicine, Southampton). Paget’s disease of bone (PDB) is the second most common bone disease after osteoporosis. Excessive formation of weak and brittle bone results from PDB. Like osteoporosis, fracture is also a well-recognised complication of PDB and early diagnosis is key to treatment, but remains difficult. 3D-imaging tools such as computed tomography and Finite Element analyses are currently being looked into to predict stresses throughout bone. Within this project, Pagetic bones will be analysed using these 3D-imaging tools to provide information about the bone structure/shape improving our understanding for the role of blood vessels in this disease. This project has received funding from Paget's Association, HEIF and the Institute for Life Sciences (PhD, Alisha Sharma) and is in collaboration with Professor Stuart Ralston (University of Edinburgh), Dr Christian Klein (Roche, Zurich), Dr Bram Sengers (Faculty of Engineering and Physical Sciences, Southampton) and Dr Philipp Schneider (Faculty of Engineering and Physical Sciences, Southampton). Images courtesy of Dr Bram Sengers. Decreased bone mass and deficient osteogenesis have been linked to inadequate vascular supply or inappropriate bone vascularity, endorsing a central role for the vasculature in bone formation. It remains undefined, however, whether primary control of bone angiogenesis might assist with long term fixation of glenoid and humeral components during shoulder replacements. This project examines the behaviour of bone forming osteoblasts derived from specific cortical, subchondral and trabecular bone regions and aims to define whether they exhibit distinct potential for driving osteogenesis and angiogenesis. This project has received funding from by Orthopaedic Research UK, Mathys Orthopaedic (PhD, Stephanie Marfy-Smith), DOT Implant solutions (PhD Aikta Sharma) and is in collaboration with Professor Andrew Pitsillides (Royal Veterinary College), Professor Roger Emery (Imperial College, London), Professor Richard Oreffo (Medicine, Southampton) and Professor Sumeet Mahajan (Chemistry, Southampton). This project looks at the role of VEGF on bone homeostasis, with a particular focus on the vasculature. Shah, M., Gburcik, V., Reilly, P., Sankey, R. A., Emery, R. J., Clarkin, C. E., & Pitsillides, A. A. (2015). Local origins impart conserved bone type-related differences in human osteoblast behaviour. European Cells & Materials, 4(29), 155-176.
Review editor. Frontiers in Bone Endocrinology. Section editor. Cardiovascular Biology, Journal of Cell Biochemistry and Function.